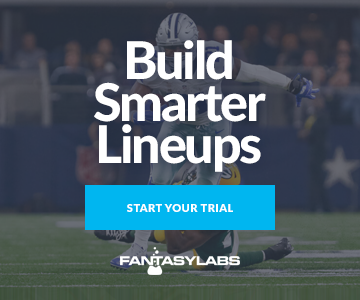 What is the Fantasy Impact of Hunter Henry’s Torn ACL? With the NFL Draft and free agency having come and gone, we’ll break down all sorts of fantasy-relevant questions entering the 2018 season. Next up is a look at the aftermath of the derailment of the hype train for Chargers tight end Hunter Henry, who suffered a torn ACL in practice on May 22.
Who Starts at Tight End for the Chargers Now? Even if Gates could remain a red-zone threat thanks to his size and chemistry with quarterback Philip Rivers, it’s probably best for the Chargers to leave him unsigned. The loss of both Gates and Henry leaves former Broncos tight end Virgil Green and veteran journeyman Sean McGrath atop the depth chart. Per PlayerProfiler, Green’s SPARQ-x score ranks in the 92nd percentile of tight ends, but he has never gained over 250 yards or scored multiple touchdowns during his seven seasons in Denver, and he finished last season as Pro Football Focus’ 59th-ranked run-blocking tight end among 72 qualifiers. McGrath is a plus-blocker but has caught just six passes in 31 games over his past two seasons with the Chargers. Keenan Allen averaged 11.0 targets per game during the final two weeks of last season with Henry sidelined, and Allen remains Rivers’ featured receiver. Henry’s absence theoretically shouldn’t have too much of an impact on auxiliary receivers Tyrell Williams and Travis Benjamin, who each most lined mostly up on the outside and ranked among the top 12 in deep (20-plus yard) target rate in 2017. The biggest opportunity available from Henry’s departure exists in the red zone. Rivers has made a career of featuring big-bodied receivers such as Henry, Gates, and Vincent Jackson near the goal line — something 2017 first-round pick Mike Williams is very familiar with. Williams stands 6-foot-4 and weighs 218 pounds, making him the team’s biggest receiver by a decent margin. Henry and Gates both ran more than half of their routes from the slot in 2017, and the Chargers utilized four wide receivers on just 12 total snaps. With Gates’ 11 and now Henry’s 12 red-zone targets from 2017 vacated, the red zone seems like a mutually beneficial space for the team to integrate Williams — its highest-drafted wideout ever — into the offense, with Allen likely to retain his lead role in that area after pacing the team with 24 red-zone targets a year ago. While there’s not much room for Allen’s top-10 average draft position to climb as of this writing, Mike Williams, Tyrell Williams, and Benjamin are still going outside the top 60 at the position and could provide value, especially in deep leagues or best-ball formats. Should We Be Concerned About Rivers or Melvin Gordon? Rivers and Gates combined to form one of fantasy’s most productive combinations for the better part of the last decade. Henry’s status as both Rivers’ most efficient target and Pro Football Focus’ No. 8 run-blocking tight end last season made it easy to envision him filling Gates’ role for years to come. Neither Green nor Gates deserves to emerge as one of Rivers’ top four options this season from a talent standpoint (though Rivers fed Gates a team-high 23 targets during Henry’s three career missed games). Losing a player of Henry’s caliber is bad for everyone involved. Still, every team deals with injuries every season, and it’s particularly difficult to value a single blocker’s contribution to a team’s entire rushing attack. Henry’s absence in the running game could be negated by the signing of free-agent center Mike Pouncey and the return of 2017 second-round pick Forrest Lamb. While the loss of his expected No. 2 target sure won’t help him, Rivers set four-year highs in adjusted yards per attempt (8.0) and quarterback rating (96.0) last season and doesn’t appear to be washed just yet, and the Chargers look to have the requisite weapons elsewhere to pivot away from a tight-end-centric offense.